The Jacksonville Jaguars defensive end talks Pilates and ice machines. 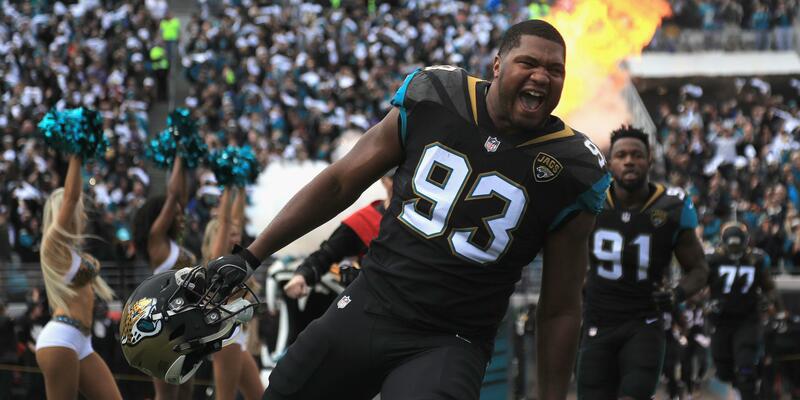 At 6 foot 8 inches and 300 pounds, defensive end Calais Campbell brought some serious heavyweight power to the Jacksonville Jaguars in the 2017 season. His dominating performance in game one against the Houston Texans, with four sacks, helped the Jags become one of the best defensive teams in the league—until the AFC Championship game, that is, when they narrowly fell to Tom Brady and the New England Patriots. After nine years in the NFL, the 31-year-old three-time Pro Bowler knows that protecting his body for the long haul comes with the territory. To survive a 16-game season (plus playoff games) staying healthy and injury-free takes grit and strategic planning. Here, Campbell gives us a glimpse into how he does it all. The Training Regimen: The most important part of my program is making sure that I keep my core strong. Lots of people work the arms and legs and neglect this part of the body, but in the sports world, a strong core helps engage all the surrounding muscles and builds a stronger body overall. I’ve been doing the same core moves for the past 10 years, but I’ve been doing more sit-ups and planks lately. I’m always trying to evolve and learn more ways to engage this part of my body, but it’s hard to get away from what I know. It’s gotten me this far. NFL training is often position-specific. As a defensive end, my first step in play is so crucial to success. I work with a few trainers, but explosive movements like power cleans, hang cleans, and agility drills are the main focus with all of them. During the off-season, I spend 90 minutes each day powerlifting or doing cardio, then when we get to organized team activities (OTAs) in April, I train about three hours each day. Yoga really helps me get that deep, intense stretch that makes me more fluid on the field. I also do a lot of Pilates because it works all those small muscle groups and stabilizers. I’m a lot smarter in my training now: I think about it more and plan my work based on how I feel instead of doing what someone else tells me to do. I’m more in tune with my body. The Nutrition Regimen: I’m very blessed because I can cheat more than most people, but as I get older those cheats become less frequent. I enjoy eating, so that’s a tough part of the job, but I do see a difference when I eat properly. During the off-season, I eat whatever I want just to get away from everything. Then, come OTAs, I try to get back into the swing of things by counting calories based on my workload and burn for the day. Once the season starts, I’ll consume up to 4,500 calories on a Monday, then more leading up to game day. I love carbs—I just eat them earlier in the day and avoid them at night. My diet consists mostly of complex carbs, protein, vegetables, and fruit (in the morning only). I eat five times each day to keep my metabolism firing. The Regeneration Regimen: I do more rehab and recovery now than I did when I was younger. I didn’t do much at all back then. Some people forget that you can’t just show up and play well on Sundays. It’s an everyday process, 365 days a year, and I’m always doing something for my body. I wear compression boots and use ice machines like Game Ready on a weekly basis, and I do a lot of rolling out. I also use a hyperbaric chamber in my house, ideally three to four times a week for 30 to 60 minutes. When I use it consistently the plan is to take my naps in there. Sleep is the best form of recovery and getting oxygen to your body is the next most important thing. Since using the chamber and taking naps touch on both of these aspects of recovery, combining them is a great tactic. What’s Next: We have the chance to be a great team this year, so I’m making sure I give everything I possibly can to this sport. You only get so many opportunities to host the Lombardi Trophy, so I’m focusing on that goal by being more disciplined in my diet, my rehab, and my training. I’m dedicated to being the best player and version of myself that I can be. This game is so special because it’s so difficult and very few people can do it at a high level, so you have to make your efforts count. Hopefully, by the end of the year, it will all be worth it.